The ABC News team discusses the Robert Mueller report findings as they relate to allegations of obstruction of justice. WASHINGTON -- The redacted report from special counsel Robert Mueller has been released to the public. President Donald Trump said he's "having a good day" following the release of special counsel Robert Mueller's report. And he said that no president should ever have to go through what he did again. Speaking at an unrelated White House event, he said, "It was called no collusion, no obstruction." And add, "there never was, by the way, and there never will be." The president is speaking an event honoring the Wounded Warrior Project's Soldier Ride, a multi-day bike ride for wounded veterans and service member. 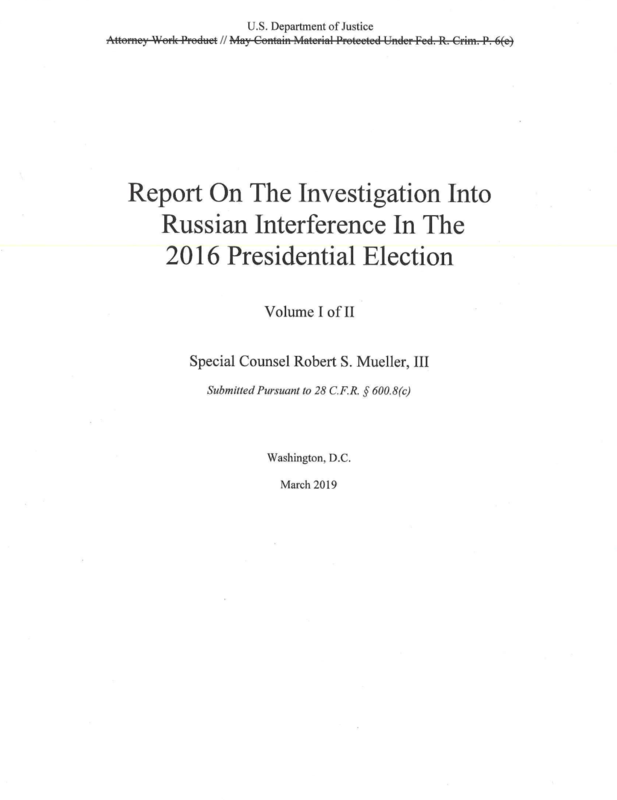 Mueller's report on the Russia investigation is two volumes and 448 pages long including attachments. The report's first volume details Russian election interference and the second relates to whether Trump obstructed justice. The report reveals how Trump repeatedly sought to seize control of the Russia probe. It says he reacted to the special counsel's appointment by saying it was the "end of his presidency." Mueller's team was dissatisfied with written responses from President Donald Trump, but decided against issuing a subpoena for an interview. Trump's responses are being released by Barr without redactions and comprise 12 pages. In Mueller's report, prosecutors called Trump's answers "inadequate." They considered issuing a subpoena for Trump, but decided against it after weighing the likelihood of a long legal battle. Attorney General William Barr held a news conference to present his interpretation of the report's findings, before providing redacted copies to Congress and the public. "The special counsel found no collusion by any Americans," Barr said in reference to Russian efforts to interfere with the 2016 presidential election. On Thursday, Attorney General William Barr held a press conference to discuss the Robert Mueller report shortly before the redacted report is released. Barr said that President Donald Trump did not exert executive privilege over any information included in special counsel Robert Mueller's report. Shortly after, the president tweeted an image that appeared to reference the show Game of Thrones with the message "Game Over." Barr said special counsel Mueller's report recounts 10 episodes involving the president that were investigated as potential acts of criminal obstruction of justice. Barr added Mueller did not reach a "prosecutorial judgment" and that he and Deputy Attorney General Rod Rosenstein concluded the evidence was not sufficient to establish the president committed an offense. Lawyers for President Donald Trump reviewed the final redacted version of the report before its public release, Barr said. He said Trump's personal attorneys requested and were granted access to the report "earlier this week" but that they "were not permitted to make, and did not request, any redactions." The news conference, first announced by Trump during a radio interview, provoked immediate criticism from congressional Democrats. The ABC-Owned Television Stations contributed to this report.